A resting vacation in a car-free spa town – not far from the pistes. That sounds appealing, doesn’t it? That is what the Fiescheralp in the Swiss Wallis is offering. As a part of Aletscharena the ski area has about hundred kilometer of varying down-hill slopes. 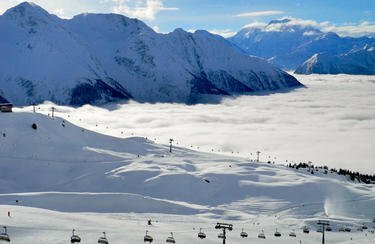 With its charming cross-country slopes and winter trails (even for dogs) the Fiescheralp offers something for every winter sports enthusiast. Get the appropriate equipment on the spot at the ski rental station of INTERSPORT Rent aon the Fiescheralp. As part of the carfree Aletschplateaus the Fiescheralp is of a very resting nature. With its wide range of relaxing ski runs its offering skiers and snowboarders with every skill set enough action and fun in their winter holidays. With the Bettmeralp and the Riederalp the Fiescheralp belongs to the ski area of Alets in Vallais - lots of fun on the pistes for the whole family.